I wanted to begin this post by referring to one of my favourite horror films of the last decade or so, The Others. If you’ve seen it you’ll know that it’s a great ‘haunted house’ movie, with plenty of suspense and authentic shudders but an absence of the brainless blood and guts that seems to sum up a lot of modern horror. For me, it’s a particular delight because it’s very reminiscent of a lot of the classic ghost stories of the Victorian era, only on screen rather than on the page. The story is also classic in its simplicity – a troubled woman who lives in a lonely old house with a couple of creepy children welcomes a housekeeper, maid and gardener who soon turn out to be more than they appear. Like all the best haunted house films, there is a claustrophobic feel from the outset, with tension that builds to a level that is almost unbearable before the dénouement (which is probably the only weak part of the film – you’ve never read a ghost story or watched a horror film if you don’t see the ‘twist’ ending coming a mile off!). One aspect of The Others that I want to talk about in a little more detail is the concept of the ‘Book of the Dead’, which, as the housekeeper explains to the woman in the film, was a book full of pictures of dead people posed as if they were alive by way of a keepsake for their families during the Victorian period. Interesting (if creepy) idea right? What isn’t mentioned in The Others is the fact that this concept of post-mortem photography was by no means limited to Victorian Britain and had not even originated there. The original Book of the Dead was an ancient Egyptian funerary text known as The Book of Coming Forth by Day. 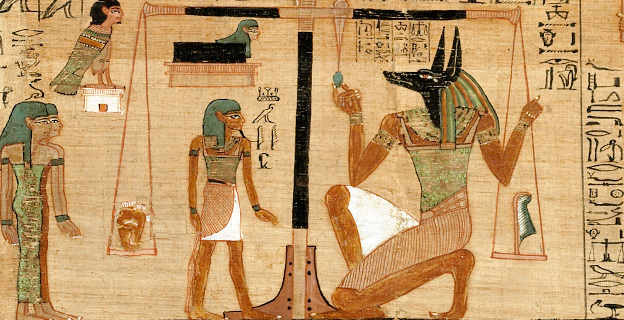 The Egyptians had strange ideas about the afterlife and what waited for the soul at the end of life’s journey. For them, the body was not simply a shell, but a vital part of a person’s soul. The Book of the Dead was a description of the ancient Egyptian conception of the afterlife and a collection of hymns, spells and instructions to allow the deceased to pass through obstacles in the afterlife. It was discovered on the first Archaeological digs in Egypt’s Valley of the Kings, written on a papyrus scroll which had been placed in the sarcophagus of a long-deceased Pharaoh. When it was later brought back to Britain in the reign of Queen Victoria it caught the imagination of the aristocracy, who at that time were strangely fascinated by death and all its trappings. The official name for photographs taken after death during the Victorian period was memento mori (a Latin phrase meaning “Remember you shall die”). Most memento mori had the same general characteristics: the deceased loved ones were usually posed as if they were sleeping or in some other normal domestic situation, surrounded by living family members with flowers arranged around them carefully (usually lilies, for death). Most creepily, the effect of life was sometimes enhanced by either propping the subject’s eyes open or painting pupils onto the photographic print. But, as I said earlier, taking pictures of dead relatives was not a purely Victorian preoccupation. In certain American states in the nineteenth century, mainly in the Deep South, Books of the Dead were viewed simply as a natural part of the mourning and memorialization process. If you ever get a chance take a look at Stanley Burns’ book Sleeping Beauty: Memorial Photography in America, which is packed full of unsettling images of the dead carefully arrayed as if they were simply sleeping. I should also mention that the tradition of post-mortem photography is said to continue in some cultures to this day, although for obvious reasons it is not widely publicized. Lastly, I hope you’ll all forgive me for mentioning that the concept of a Book of the Dead is central to one of the stories in my own collection of supernatural tales, Ghosts in the Cloisters. You will of course have to order the book if you want to read the story in question but all I’ll say for now is that it is inspired by all of the weird and wonderful ideas above – I hope you’ll like it. Great post! I love Victorian ghost stories (felt the same reminiscence when I saw the others) as well as the history of the era.